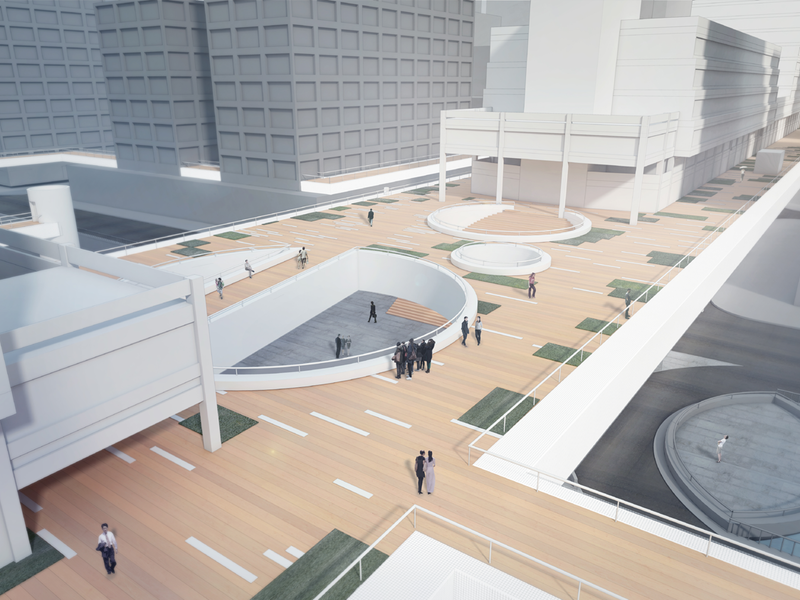 Public park, elevated pedestrian walkways, urban regeneration programming proposal. 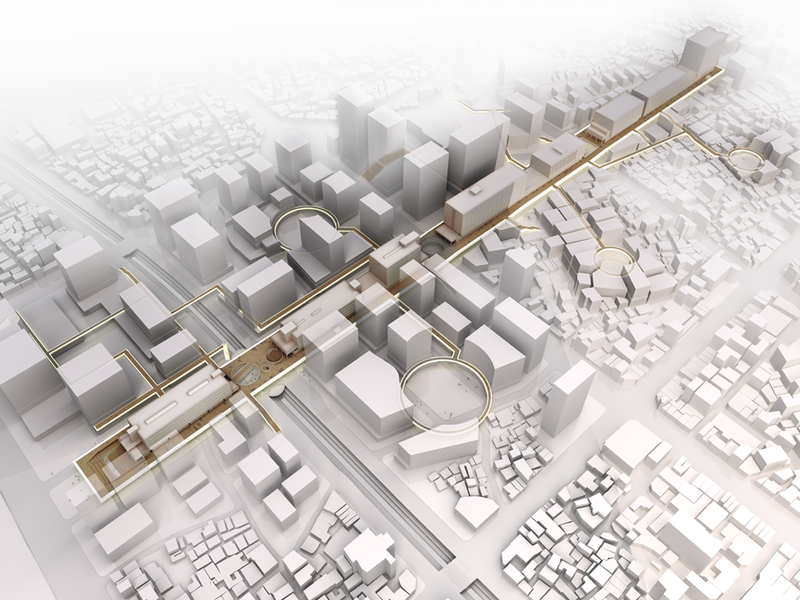 This project proposal incorporates a design for the ‘Seun City Walk’ at the existing Seunsangga complex in Seoul, as well as an urban regeneration scenario for the area it is located in. 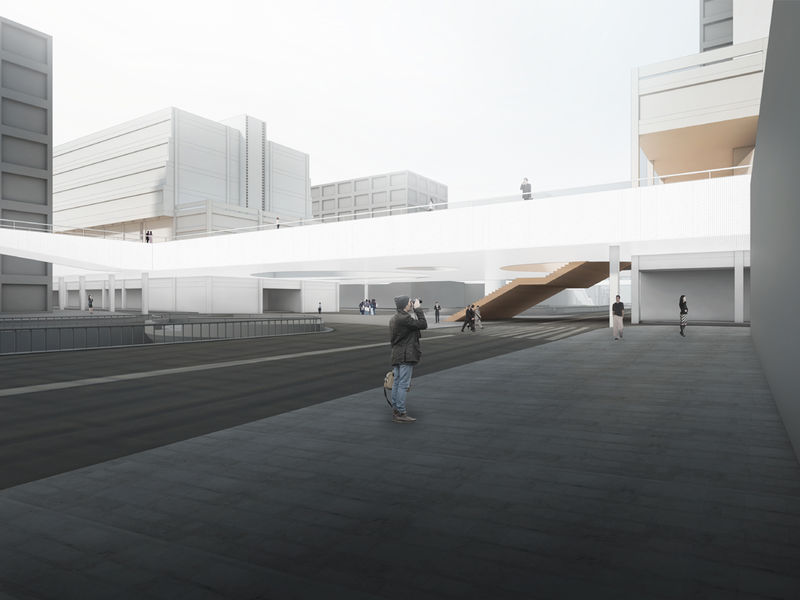 Focusing on the revitalisation of the Seun District as a whole, the design for the raised pedestrian walkways carefully interweaves with the surrounding neighbourhoods, using its architectural properties to stimulate certain preferred scenarios of development over time. While we assume that processes of self-organisation and a market-driven property regeneration process may lead to the most well-adapted outcome for many, we recognise that there is a key responsibility to safeguard the unique qualities of the surrounding district. 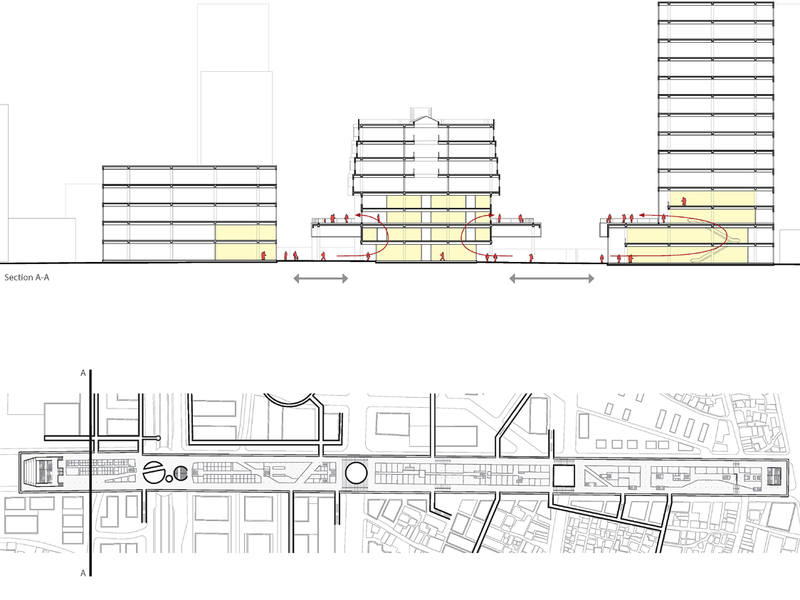 Our proposal speculates along possible scenarios for this type of preservation, inviting new and transformative forces into the neighbourhood while allowing existing communities to retain their trades. 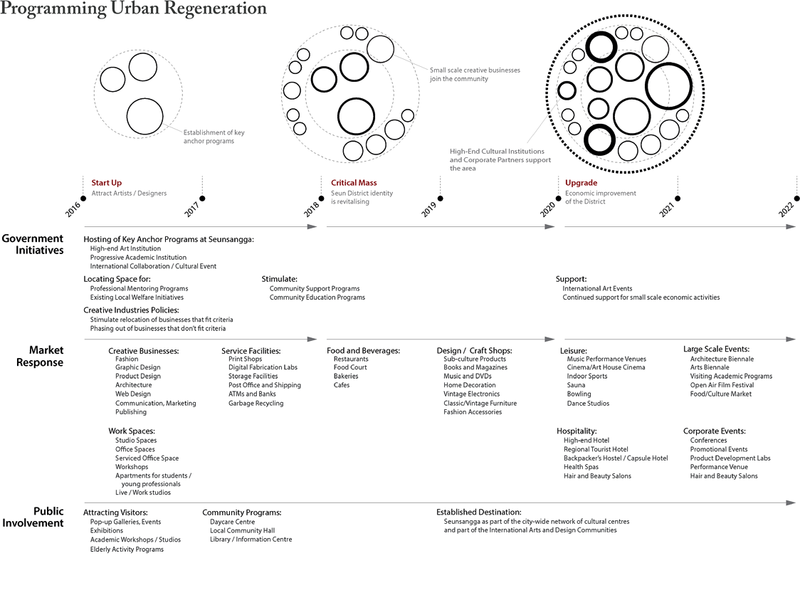 It envisions a mechanism to combine different scales of urban fabric, mixing existing and new types of economic activity for the benefit of all stakeholders. 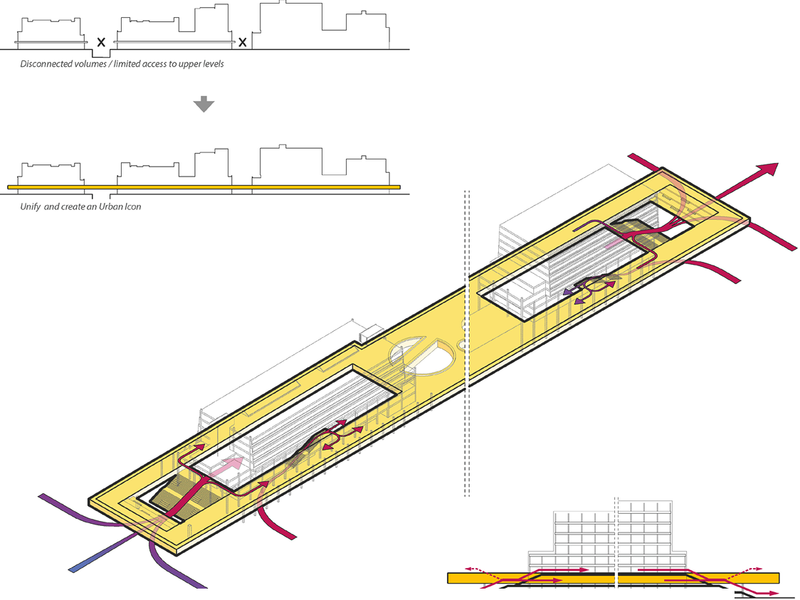 We propose an architecture that is primarily an urban device – a strategy for urban regeneration. 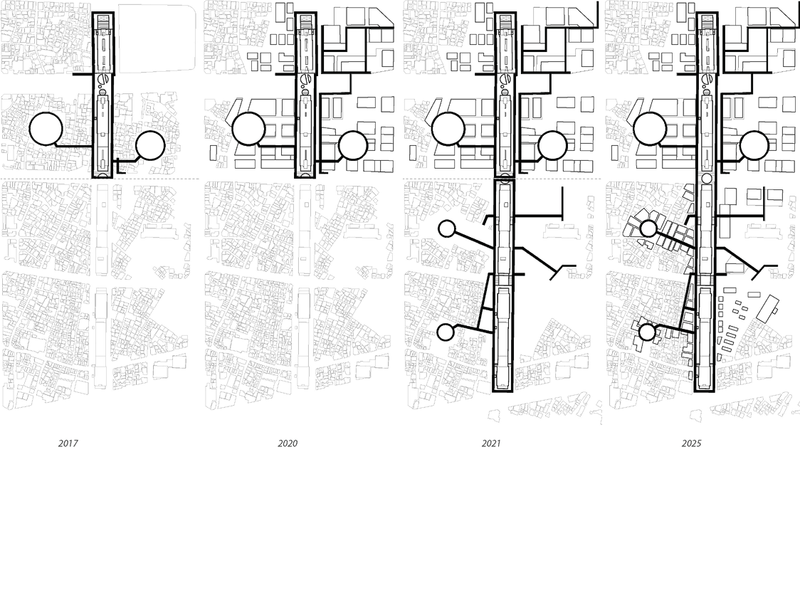 Our proposal takes the characteristics of a network, and translates it into architectural form. 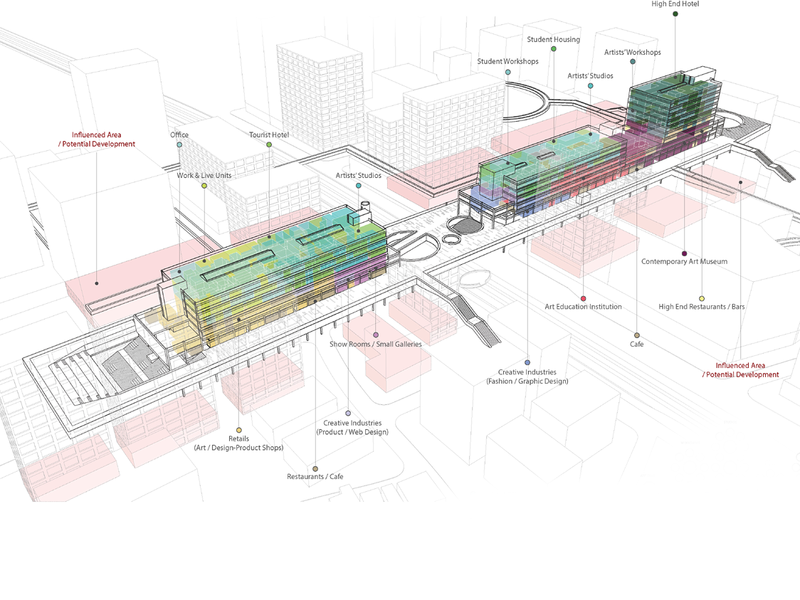 It applies strategic connections and differentiation in scale throughout the district, by dividing existing plots into sectors surrounding circular plaza spaces. 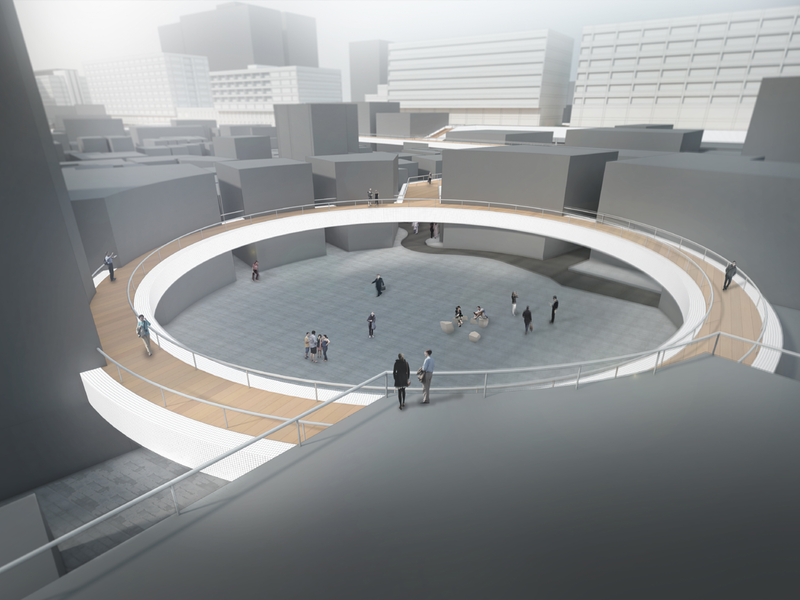 It also brings these sectors together, by physically connecting them into the new Seunsangga pedestrian deck. Where the networks converge and form intersections at the deck, we propose a range of community services aimed at capitalising on the unique skills and infrastructure present at the Seun District. As we address the characteristics of an urban ecology, we propose a structure that operates as an icon at the neighborhood scale. It uses a striking simplicity to bring unity and focal points in a pleasantly chaotic urban fabric, that can be allowed to remain diverse. Through it’s form it becomes a social tool, regulating different scales of urban development and stimulating interaction between different user groups. We propose a development strategy based around creative industries, following successful examples of similar neighbourhood transformations in cities around the world. 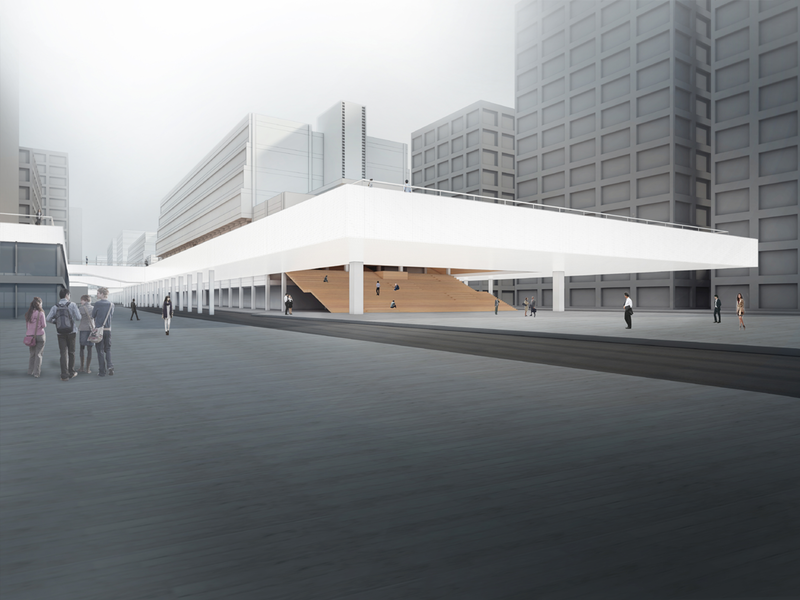 The elevated pedestrian deck is designed as a ‘frame’, encapsulating the buildings and compensating for irregularities. Activities and viewing opportunities at the spectacular cantilevering urban balconies will draw visitors through the interior of the buildings and past the newly activated retail locations. Access to the deck level from the ground floor is through the interior of the buildings, drawing visitors into the interior and activating programs around the vertical circulation zones. the ‘798’ art district in Beijing, we speculate on the self-organised growth of new programs inside the Seunsangga buildings. Local authorities will play a key role in the relocation of strategic anchor programs such as a high-profile art institution and/or academic institution. The self-organised clustering of similar programs and supporting services around these anchors will gradually result in the buildings become a critical mass of creative industry participants, following the recipe of an ‘intricate and close-grained diversity of uses that give each other constant mutual support’ (*quoting Jane Jacobs). The ‘frame’ that encapsulates the Seunsangga buildings unifies the old and new sections of the pedestrian route. It is as thick as possible, creating a robust frontage that is highly visible from different vantage points. The ‘frame’ is materialised as a light box, presenting itself as a brilliant white strip throughout the neighborhood in both day-time and at night. The ‘frame’ wraps around the existing deck structure, taking advantage of the additional set back distance to the surroundings to create a cantilevering volume. Existing stairs are removed due to safety concerns and to give the new deck a weightless appearance. The space inside the deck structure allows for additional services to be placed, as well as for hiding any concrete repair measures that are necessary. The light emitting material also wraps onto the ceiling above the covered streets, improving the lighting quality and general atmosphere of the undercroft areas. It also wraps around to the top surface, forming a consistent visual element as seen from the many taller buildings surrounding the site. of the ground level, rather than a displacement of it.